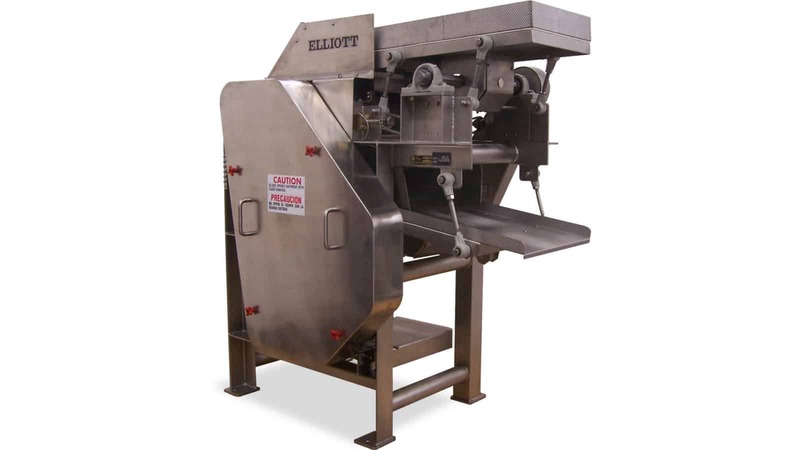 The Elliott Fresh Fruit Macerator extracts pits from fresh fruits such as apricots, peaches, cherries, plums, prunes and other products of like nature. 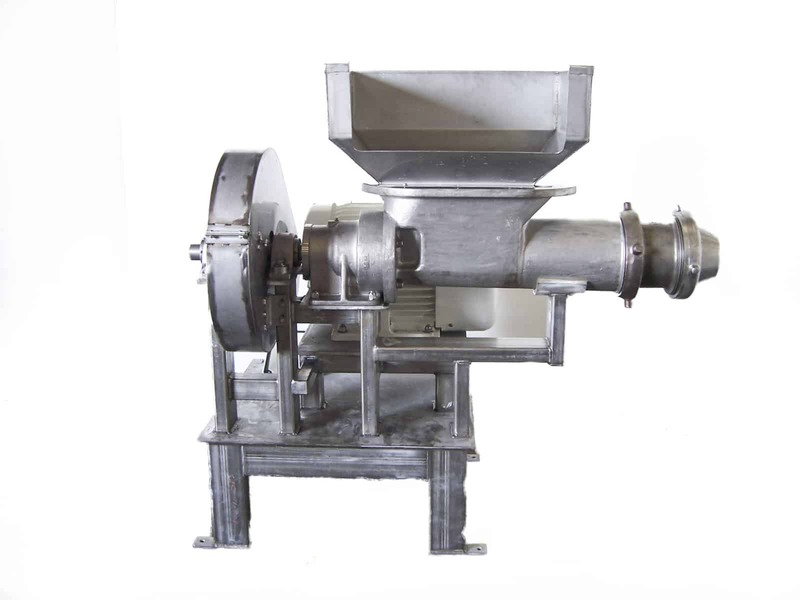 It is used in the processing of fresh nectars, jams, preserves, bakery, quick-freeze and fruit by-products. Our most popular model is the VV, but other models are available depending on the capacity desired. All machines can be modified for your particular application. The machine consists of two revolving rollers; one of soft rubber and the other a series of steel saws spaced approximately 1/8″ apart. The whole fruit is fed directly to these rolls via a feed shaker on the machine. An automatic plunger positively force-feeds the fruit between the rollers. Extractor fingers located between each saw on the front side of the saw roller, strip out the pitted fruit onto a discharge chute. A knife on the underside scrapes off the pits adhering to the teeth of the saws and deposits them onto a shaker that discharges them to the rear of the machine. The shaker can be equipped with a special screen and juice pan, so any juices carried over with the pits can be drained off and discharged at the front of the machine along with the pitted fruit. The entire process of pitting is performed in one continuous operation. The method is simple, effective and economical. The resulting product is flattened, with a waffle-like appearance made by the teeth of the pitting saws. The macerator can be fitted with a calyx remover if required. These machines are all heavy duty Stainless Steel construction with NEMA 4 electrical for easy and thorough wash downs. They are designed and constructed to provide decades of use. 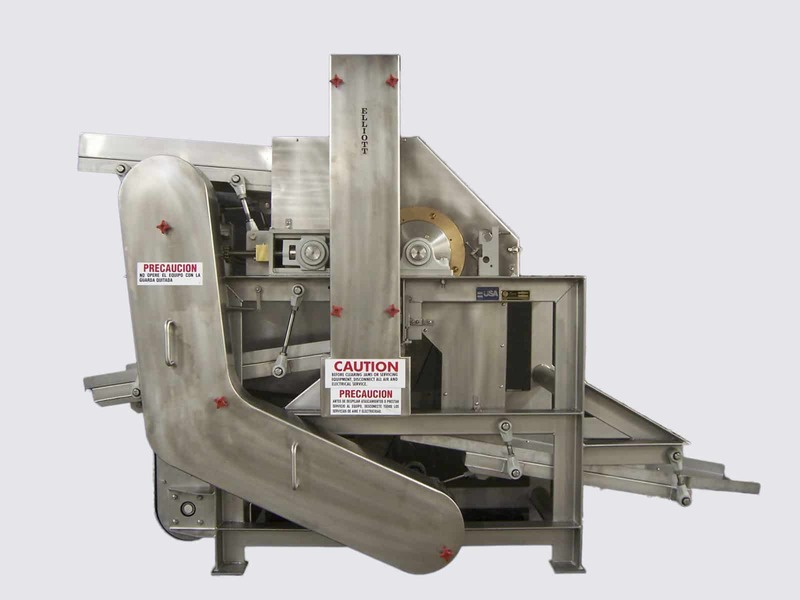 This Shaker can be equipped with a special Screen and juice pan, so any juices carried over with the pits can be drained off and discharged at the front of the machine along with the pitted fruit. The entire process of pitting is performed in one continuous operation. The method is simple, effective and economical. This 50 HP grinder is capable of double grinding the product to a fine paste. It is suitable for any pitted fruit and makes a nice accessory to our macerator. It is normally wired for 480 volts 3 phase 60 Hz. use, but other options are available to suit your electrical needs. Construction is all Stainless Steel and can receive full washdown.